Get the Softest Natural Hair with the Baggy Method! 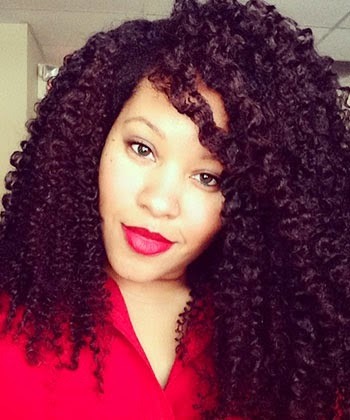 from eclark6's ultimate twist-out guide! Read any curly forum, group, or blog, and you will quickly be faced with questions like: Where can I get the most moisture? What products will yield the most moisture? What’s the secret ingredient for moisture? Having curly hair is a never-ending quest for hydration, and many naturals suffer from dry hair or brittle ends, which then lead to fragile hair and breakage. If you want to give your hair the best possible chance of retaining length and feeling its softest, then you need to keep your hair moisturized, with an emphasis on your ends. The baggy method is a highly popular technique and a creative solution for locking in your moisture. Many curlies swear by this method on their journeys to longer hair. Many get this method confused with the greenhouse effect. The greenhouse effect is designed to stimulate your scalp’s natural sebum using your own body heat. You simply add a natural oil and/or butter to dry or damp hair and cover with a plastic cap. I'd like to clarify that the baggy method and the greenhouse effect are not the same. This method is also different from a pre-poo because you do not follow up with washing your hair and this is done on clean hair. A pre-poo is combatting the effects of the cleansing with shampoo, which can be harsh on your strands. It doesn’t seem to matter if you use a moisturizer or a conditioner as long as it’s something your hair responds to very well. There are two ways to do the baggy method to retain moisture. The all-over method is usually done on freshly washed hair. You apply your favorite moisturizer or a dab of conditioner to your all of your hair. If you are noticing split or dry, brittle ends then try baggying on your ends. Apply a moisturizer or a dab of conditioner and use saran wrap or a Ziploc sandwich bag secured with a ouchless hair tie on your bag. Either method can be used for three or four hours or overnight but not any longer as our hair needs to breathe. The baggy method is great for softer, moisturized hair but it doesn’t need to be done every day. Your hair must have time to dry out completely. It’s not healthy for hair to be constantly wet or damp over long periods of time. Most curlies and coilies will wear this overnight for maximum benefit. Do you baggy your hair? Which method do you prefer?